It's been a while, but we haven't been idle. We are still in Moria, in fact we are assaulting the more dangerous strongholds of the orcs within Khazad-dûm and have reclaimed the big crossroads of the Grand Stairs. But let me start where I left off. So, after the Water-works we went back to Brogur in the Twenty-first Hall and reported that we had discovered the lair where that malicious tentacle creature from the pool is now hiding. We were told to wait with our attempt to kill it a bit and stayed a couple of days in the big hall. Made friends with a dwarf named Reinn, a nice, reasonable elderly fellow with white hair and a white beard and I had hopes that he may join our group. I don't know what exactly his position in the Twenty-first Hall was, it seemed as if he was an assistant to a dwarf named Mögr, who himself was the foreman of the guards. But for an assistant he surely had his own thoughts about how the operation should be handled, always warning the easygoing Mögr to be more careful, that there are problems that shouldn't be ignored, like orc-arrows lying about nearby or large rocks falling down from the ceiling and leaving big craters on the ground. But Mögr wouldn't listen, saying he ruins his troops' morale and maybe he was also annoyed by Reinn's constant nagging. So he sent him out to go and explore the halls himself. We accompanied him and I even told him when we left that he wouldn't have anything to worry about, as he is with us. He greatly enjoyed seeing the wonderful Halls of Durin. Turned out we found a merchant named Domarr on his way to the Redhorn-lodes and he warned us about a larger orc camp nearby. Says the place was far from safe. He even showed us where the camp is and as we were hiding beneath some stairs below the camp, Reinn made off, saying he knew there were troubles and he will report back to Mögr. As the halls had been pretty safe except the odd weak goblin here and there, none of us thought much of it or stopped him, or went with him. 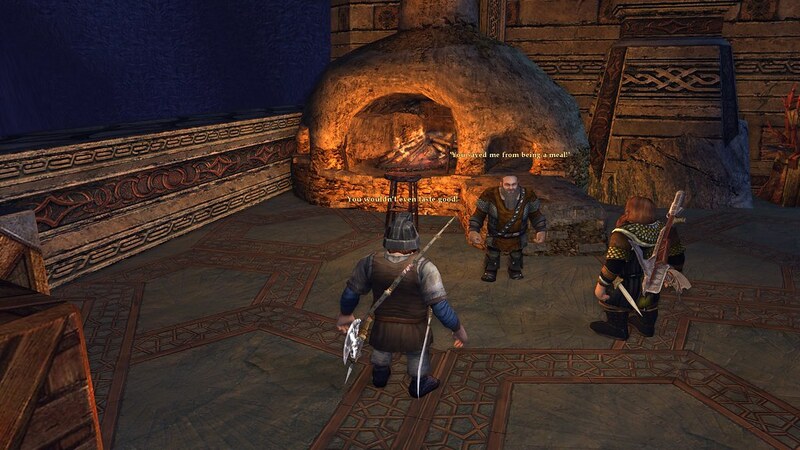 Instead we mustered and cleaned out the orc camp and when we got back to the Twenty-first Hall, Reinn wasn't there. I started to worry and we put together a search party, and after some looking around we found him, lying in a hallway with his face down on the cold stone. It was a terrible sight which shook me right to my marrow. He was dead, murdered by an orc. We found his killer and slew him, but revenge didn't feel sweet at all. I was devasted and blamed myself for this happening. We, or some of us, should have kept him company or stopped him from running away all on his own. We told him he would be safe with us, and now he is dead. A fine dwarf he was. Mögr was really devastated and shaken too. His head and shoulders sagging, he blamed himself just as I did blame myself, for sending him away. He promised to never let his guard down again, but it was just a small consolation. When I told the others how I felt about the whole thing, Sagla was pretty cold about it, or logical as she always is, saying we cannot take care of everything and everyone and dwarves should know how to handle themselves. Well, there was nothing more to do about it and we were sent to assist the dwarves in Orc-watch, an outpost way down near the Redhorn Lodes. It was a rather long trip, down winding corridors and flights after flights of stairs, and along a wide underground tunnel, and when we finally got there, it felt as if we had reached the deepest parts of Moria. On the way we were on a war path, I had to think of Reinn all the time. We found many more orc camps. They seemed to be everywhere. We cleaned out all those we found pretty thoroughly, burning their tents, destroying barricades, provisions and totems. 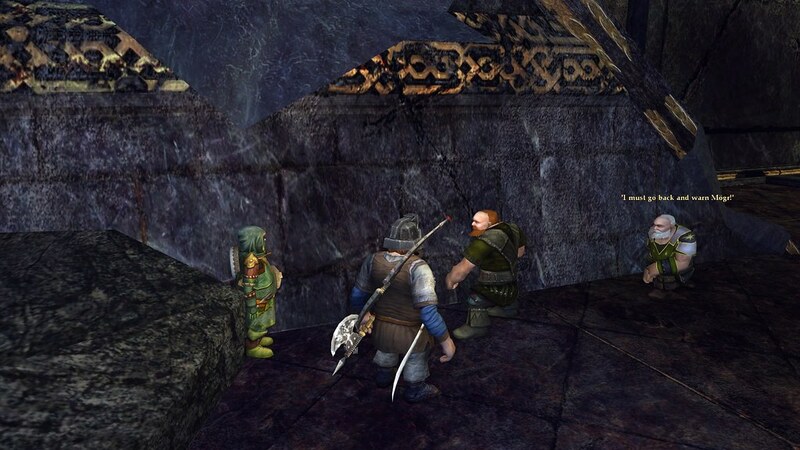 In one well-hidden camp, tucked away in some remote corner, we stumbled upon a large Uruk, an emissary from the White Hand, negotiating with the Moria orcs there to join him and his crew. We destroyed them all. We found a large supply camp complete with a kitchen, an open mess hall with crude dining tables, ovens, sleeping quarters with bunk beds and all. They held a couple of dwarves prisoner and it was rumored that they were going to eat them. We freed them and they were extremely relieved and thankful, dashing off immediately towards the Twenty-first Hall. I hope they got there safely. Still a bit further down was a forge, where they made weapons and armor and we made sure they cannot do that anymore. One of the camps was particularly worrisome. Several orc-defilers were brewing up some kind of poison. They even had a steaming, smelly pool filled with a viscious goo. And from the looks of it, they tested the poison on their own kind, for there were many dead orcs that had suffered a gruesome death. Most of them they had piled up and burned in a back room, maybe out of fear to get infected themselves. 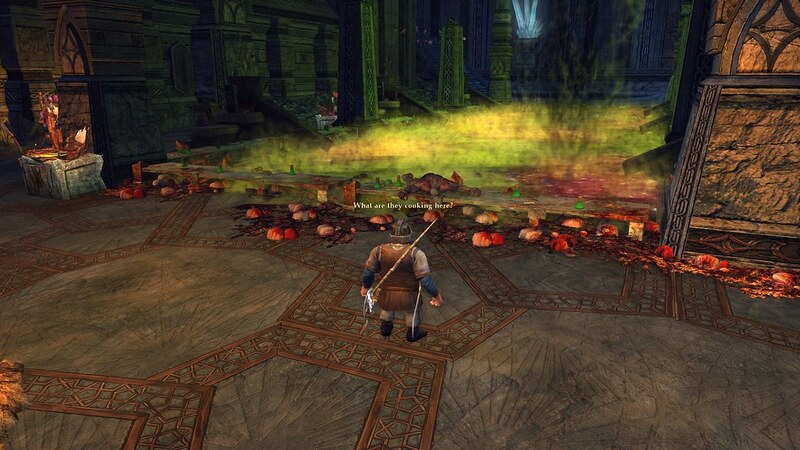 We also made sure to clean that place out thoroughly and destroyed all the defilers and their ovens. What an evil place that was, but it shouldn't be a threat to the expedition any longer. We were all happy when we were done, had left and could breathe fresh air again. Then we got lost in these unending halls and it felt like we had wandered about for hours. Hedge studied his maps and scratched his head. He didn't know either. But he was certain that the Orc-watch couldn't be far off, so we kept going. We followed another hallway to the east, got into another large room and found a set of traps. We determined they had been set up by dwarves and carefully made our way around them. And then we found the dwarves, in a well-fortified post with barricades made of iron and thick wooden spikes to defend against any assault. 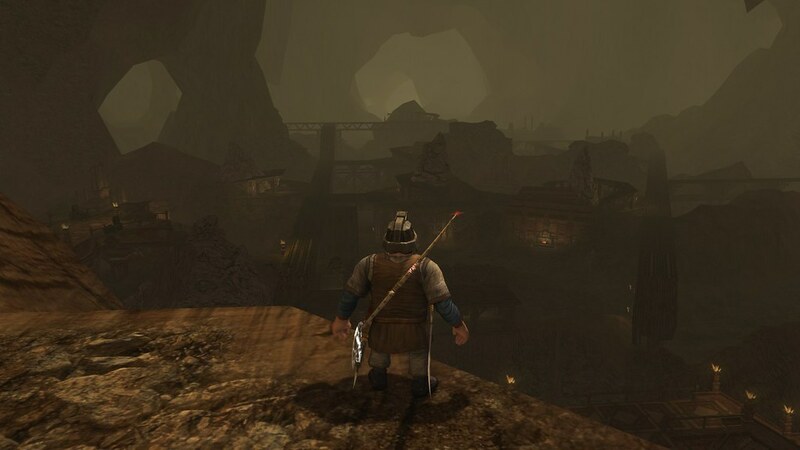 Looking down, we saw the dusty, yellowish haze of the vast cavern which is the Redhorn Lodes. We were clearly very deep down in Moria now. I will write about our adventures there next time.